Karen Twichell learned the hard way that resources and support for caregivers are sadly lacking. A professional woman with a management position in the aerospace industry, Twichell had little in the way of preparation for the job of caregiving. But time after time over the past thirty years, as one family member after another was stricken with different cancers, she answered the call and took up the mantle of caregiver. Her mother, father, brother and mother-in-law eventually succumbed to their illnesses. Two sisters and her husband are cancer survivors. Managing the doctor visits, the medications, the physical, emotional, and spiritual strain of day-to-day care for her family members, might seem overwhelming by ordinary standards. But Karen Twichell is extraordinary. While facing the challenges and pain of her experiences, she learned that millions of Americans were in the same boat. "There's not too much help out there for the caregiver," she said. In response to the need, she wrote A Caregiver's Journey --- Finding Your Way, which received the 2001 Writer's Digest National Book Award Certificate of Merit. Like her book, her presentations are sensitive, yet practical guidance for people facing the unnerving challenge of caring for an ill or elderly loved one. The bottom line is this: you have to take care of yourself, too. The analogy she often shares with audiences is that of a flight attendant telling passengers that, in an emergency, they should put on their own oxygen mask before trying to help someone else. Karen's presentations are like that oxygen mask: they make it possible to take care of others successfully. 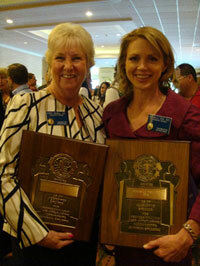 Karen recently earned the prestigious designation of Toastmaster Accredited Speaker. It is the highest earned designation from Toastmasters International for outstanding professional platform speaking, held by only 60 members from the current 260,000 membership in 113 countries. Here is Karen with fellow Accredited Speaker, Rochelle Rice. Karen has also been awarded the WomanSage Family Matters Award. "WomanSage Family Matters Awards are given to everyday midlife women who make significant contributions to improving the quality of life for families in Orange County." Click here to book Karen as a speaker at your next event!